As far as I'm concerned, there hasn't really been a portable Assassin's Creed worth playing. Despite the release of three story-based handheld games -- only one less than the console releases -- they have contributed nothing of value to the franchise's story or characters. 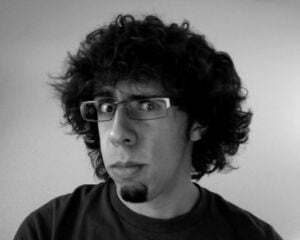 So when news broke of a new installment for Vita, it was perfectly reasonable to have doubts. This is especially true since the promise of a console style had been made before with the PSP's Assassin's Creed: Bloodlines. But the Vita is no PSP, and Assassin's Creed III: Liberation is a new chance to make a quality Assassin's Creed game for handhelds. Perhaps in an effort to distinguish itself from past spin-offs based on console characters, Liberation features a new female protagonist who lived in the same period as Assassin's Creed III's Conner. And just like ACIII, it's looking fantastic. It's 1765, and there's trouble in the South. The Louisiana Rebellion is brewing, and Aveline de Grandpre, a French-African assassin, must help fend off Spanish soldiers in New Orleans. Parts of her story will cross over with Conner's in ACIII, but for the most part, she'll be on her own. 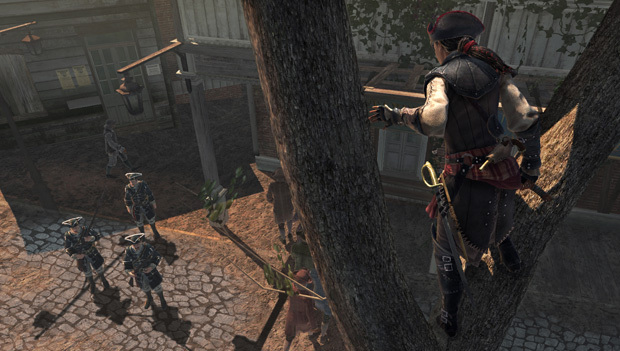 Just like Conner won't be stuck in cities like Boston, Aveline will be able to explore outside areas. Examples given include the bayou, a wilderness area that functions like the frontier in ACIII, and Mayan ruins in Mexico, an area which hopefully gives fans that follow the minutia of the mythology something to wonder about. Don't expect any modern-day revelations though, because Desmond isn't related to Aveline and won't be framing the story. The demo, however, was set purely in New Orleans, 1768, in the midst of a riot against the Spanish soldiers. Aveline must support the townsfolk and keep them from getting killed. Starting above the action, she finds a soldier below to perform an aerial assassination on, leaping down and using her target to break her fall. This provides enough charge to a new meter to let her access the redesigned quick-kill system. First introduced in Assassin's Creed: Brotherhood, the old quick-kill system required timed, focused button presses after Ezio achieved his first kill in a group. 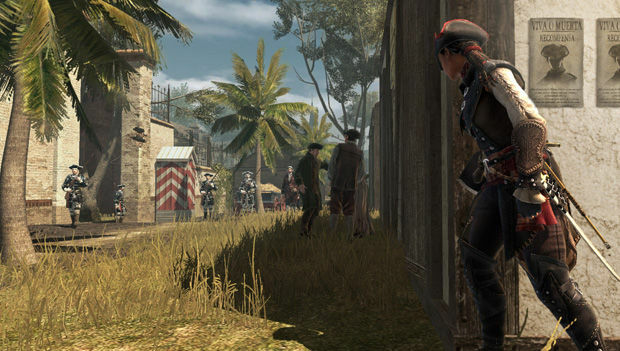 Liberation's new system slows down time and allows Aveline to pick her targets just like Splinter Cell: Conviction's "mark and execute" system, wiping out the soldiers once the mode is exited. 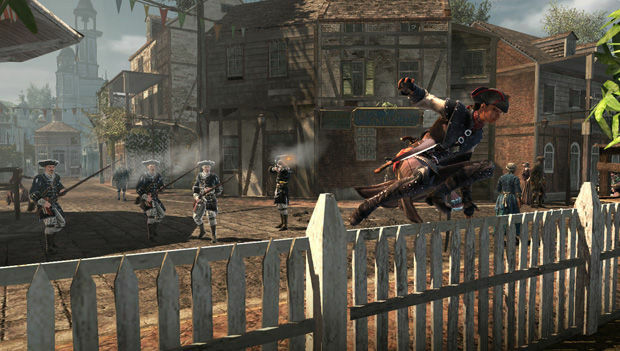 As combat progressed, I got a chance to see some of Aveline's new tricks. Besides the usual hidden blade weapon and her version of Conner's hatchet, a machete, Aveline has a few gun options. The pistol functions similarly to the Renaissance-era pistols of past games but with a bit more speed and less range, as well as the option to dual wield. On the other hand, the musket is slow, but more powerful. Both guns are loud and likely to draw more attention to Aveline, but at least she has the option of stabbing an enemy with the musket's bayonet. Rounding out the notable weapons was a poison blowpipe, which worked just like a crossbow loaded with poison arrows. The touch screen can also be used to pause the game and switch between the weapons. Soon, a carriage full of gunpowder is lit on fire, requiring Aveline and an ally to drive the carriage through the streets to get it away from the crowds. The direction is naturally controlled with the left analog stick, while acceleration is handled by pressing the touch screen. I wasn't quite sure why this system was better than pressing a button, but it seemed to work well enough. Aveline successfully gets rid of the carriage and jumps off before it explodes, leaving her with one last last duty: to save some kidnapped rioters. She storms a building, picking off guards along the way with a combination of stealth and aggression, and finally rescues the prisoners. The demo officially ended at this point, but I was also shown a separate area of the game, the Governor's Palace of New Orleans. Certain landmarks were shown, such as the St. Louis Cathedral, the highest building of the time. It's certainly not anywhere near as high as some of the points in the past games, but it still gave an impressive view of the city. I haven't visit New Orleans before, so I can't speak to the accuracy of the layout, but I still came away impressed by the work that went into creating the city. Like ACIII, Liberation looks to be an exciting new take on Assassin's Creed with all the new shine of its big brother. My only concern is the fact that both games are releasing on October 30, 2012. Two meaty, console-quality, open-world adventures set in the same time period may overshadow each other, despite their different protagonists and geographical settings. Of the two games, ACIII is clearly the one that's more important to the franchise's continuing storyline, so it would be a shame to see Liberation lose out in the process. Hopefully my fears are unfounded.